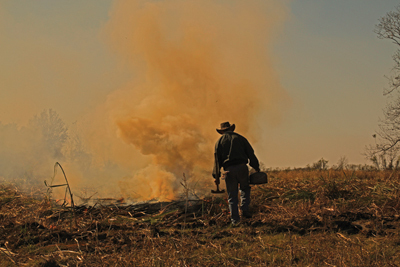 A farmer in the Franklin area burns leaves and shucks of sugarcane as a means of disposing of this unwanted organic material before the cane is hauled to the mill. Sugarcane was introduced to Louisiana when French Jesuit priests brought the first stalks to New Orleans in 1751. Forty-four years later, plantation owner Etienne de Boré succeeded in producing granulated sugar from sugarcane, and the Louisiana sugarcane industry was born in earnest in the Crescent City in the winter of 1795. From that point on, sugarcane plantations – many of them complete with their own small, primitive sugar mills powered by farm animals – began popping up along the Mississippi River in the New Orleans area. Then they began to appear along other major south Louisiana waterways, including the Red River, Bayou Teche and Bayou Lafourche. For well more than two centuries now, sugarcane has been the livelihood of generation after generation of cane farmers and millers and those they employ. Through the years, more and more acreage was planted to cane, and technological advances made many aspects of cane farming more efficient and much less labor-intensive. Still, this is an industry defined by seasonal routines: planting, cultivating, fertilizing, fighting insects and funguses, harvesting and milling. Then there are factors that are not within the farmers’ control as they hope for a good market price per pound of sugar, wish for the right amount of rain, and pray that the crop is not ruined by multiple hard freezes or untimely hurricanes that can twist and flatten the cane and kill any chance of making a profit that year. The grinding season ends when the new calendar year begins, and it is then that farmers start to get their fields and equipment back in shape for the next growing and harvesting season. Likewise, this is when mill owners and foremen see to it that their equipment is cleaned and repaired and that some of it is replaced. A billet cane harvester cuts cane into 12- to 30-inch pieces (billets) and loads it into a cart. A traditional whole-stalk harvester cuts cane and lays it down across the rows. Field workers hand-plant whole-stalk cane. When September rolls around, the harvest begins again as the cane is cut by mechanical harvesters, or combines – either the traditional whole-stalk cane-cutters or the more modern, more highly mechanized billet cane harvesters. Signs that the harvest is underway begin to appear as smoke rises from the burning fields and cane trucks and tractor-drawn carts full of cane are seen on the back roads and highways. At the same time, the mills are cranking up and beginning their 24-hour-a-day, 7-day-a-week marathon that goes on for about four months. The cane arrives at the mill and it is weighed, sampled for sugar content, offloaded, washed and pulverized before the juice is squeezed from it. The juice goes through various stages – heating, purification, evaporation and crystallization – before coming out as raw sugar. The raw sugar is shipped to the refinery, where it is further processed to remove molasses, moisture, impurities and even its tan color. Then it is bagged for consumers or packagers or sent in bulk via train to food-processing companies. After all is said and done, 20 percent of the sugar consumed in the U.S. comes from the cane fields of South Louisiana, where approximately 400,000 acres are planted in 22 parishes. Some 17,000 people work in this industry. The state’s 11 sugar mills process about 13 million tons of cane, and the industry’s overall economic impact on Louisiana is an estimated $2.8 billion. This vital industry and the people who work in it are recognized and even celebrated each year through the Louisiana Sugarcane Festival in New Iberia and the Sugar Bowl football game and related activities in New Orleans. At Sterling Sugars in Franklin, raw sugar is loaded into a barge bound for a refinery. At the end of the sugarcane milling process, raw sugar is moved by conveyor belts to the sugar warehouse and is slung into a pile by a sugar slinger. RONNIE OLIVIER is a sugarcane industry safety consultant. He is the photographer and author of the newly published book titled Louisiana Sugarcane Pictorial, available at acadianhouse.com.